Incomplete and reportedly un-Kafkaesque, Amerika (1927), or The Missing Person to use its author’s preferred title, is one of the least written about of Kafka’s works. Published posthumously with the help of Max Brod, it is the first novel Kafka started but one that remained unfinished at his death – these bare facts, I will admit, did not entirely inspire my confidence. Nevertheless I went in with an open mind. The plot is fairly simple in outline, following the misadventures of a young immigrant to America. Karl Rossman – a teenager from Europe – makes his way from the harbour at New York across the country on a journey to Oklahoma. Having fled his home in disgrace following an unacceptable liaison, the young man is all but penniless and is fortunate to fall into the hands, in an implausible turn of fate that will not surprise Kafka readers, of his wealthy uncle. Here he finds refuge but also finds his wings clipped by his relative, who wishes to keep his nephew close. It is a relationship that is destined not to last and finding himself on the road once more, Karl falls in with a pair of vagrants named Robinson and Delamarche. These are not people to be trusted as Karl soon discovers and his journey continues alone as he moves from one position of vulnerability to the next, barely scraping a living as he does so. Job after job falls through, leaving Karl headed off in one direction after another in a never-ending quest for a place to settle and a job that pays his way. Karl remains locked in this Sisyphean trek across an imagined America even as the novel closes. Kafka never set foot in America and so his vision of the country is that of a land dreamt up from deep inside the heart of old world Europe. And yet Kafka recognised the problem of identity and locating a home in the vastness of America and related it to living in the bureaucratic society of German-occupied Prague; alienation, after all, is universal. As Karl wanders the imagined plains of America in search of redemption following his original sin, the solution is always unseen and ungraspable, which puts one in mind of Josef K.’s predicament in The Trial. In the characters Karl encounters on his way, we see reflections of the figures of authority in Kafka’s later novels who wield their power over others casually. We also see snatches of the absurd and comic encounters that typify the surreal style Kafka would later develop. Karl is arguably Kafka’s most sympathetic protagonist and so as the hands of fate prod him in one direction or the next as he navigates the dreamscape in which he is trapped, the reader feels for him more acutely. Certainly there is despair for Gregor Samsa and frustration at Josef K.’s never-ending pursuit of definitive answers, but in Karl Rossman, Kafka creates a character so completely naïve to the world that one cannot help but feel badly for him as his innocence is repeatedly taken advantage of. 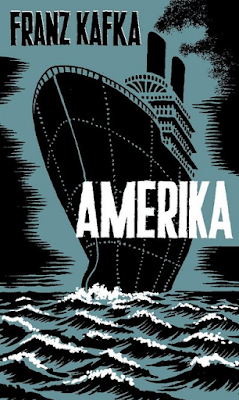 With Amerika, Kafka draws on the writing of Charles Dickens, and playfully twists the aspirational bildungsromans of writers like Horatio Alger by imbuing his own America with a sense of the fantastic but also of the impossibility of finding oneself a place in such a vast, disinterested country. Dickens is an interesting comparison as here Karl reminds one of Dickens’s early and less satisfying characters – Oliver Twist, for example, or maybe David Copperfield – who were too full of light and naivety. Both Dickens and Kafka went on to write more world-weary characters and it was in these that they found their greatest route into the minds of readers. For Kafka would have to recognise the guilt inherit in us all in his protagonists before they became truly compelling. In fact, in Amerika it is arguably the characters around Karl that have a greater impact as depictions of what life in a metropolis, or maybe we should say simply life, can do to a person. It is in these characters that the richest material for a Marxist reading of the capitalist machine Kafka envisions lies. 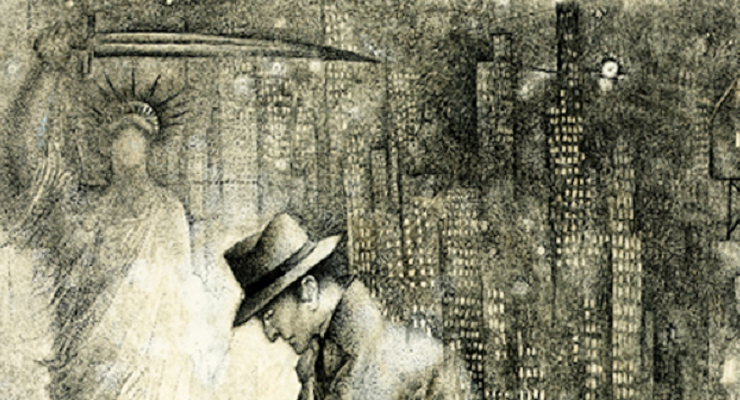 In tone, Kafka hints at the brilliantly uncanny worlds he would create in later works. Fittingly, much of Amerika takes places in the shroud of night, in a noir half-reality, allowing for a psychoanalytical reading of the events as representations of the deepest levels of one’s subconscious and America as the playground in which such internal battles are fought. Yet his America, for all that it is a construction of Kafka’s own mind, is certainly based in real geographies in a way that later works would not be. For a first attempt at the form, Kafka writes well enough but his prose does not have the air of a master who has found his style and sculpted it to his purpose. Instead, there are touches of the Kafka of later novels but also plenty of prose that is competent but far from unique. There is certainly humour in the episodes Karl experiences through the narrative although at times his own naivety and idealism is overplayed, but the complete claustrophobia of living a life which is not entirely under one’s own control is missing here. While Karl is subject to forces external to himself at times, these do not stitch together to create the horrifying and inescapable powerlessness of The Trial and instead we have episodic experiences that are varyingly successful. For anyone who has read plenty of Kafka previously, this is an interesting insight into his development as a writer but for others who are less familiar with Kafka’s work, Amerika will appear unremarkable and is not the best place to start on the work of one of the early twentieth century’s most important writers.